On Tuesday, April 11, 2017, at 12:30 PM, Corcoran Police Officers were making a traffic stop on warrant suspects Levi Wilson and Rebecca Gutierrez in the parking lot of Auto Zone. 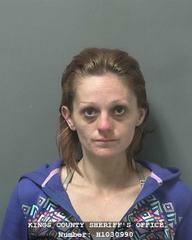 Wilson was a suspect in a stolen vehicle case out of Tulare County and was suspected of being in possession of stolen property from the stolen vehicle. When the Officer activated their overhead emergency lights to initiate a traffic stop, Wilson fled the area, failing to yield to the officer. 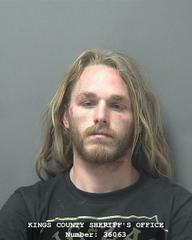 Wilson evaded officers for approximately 35 minutes, before his vehicle became stuck in a field in Tulare County. During the pursuit Wilson drove at the police officers almost striking them with his vehicle. Wilson and Gutierrez were taken into custody for their warrants at the conclusion of the pursuit. A large amount of stolen property was located in the back of their truck. After being taken into custody Gutierrez stated she told Wilson to stop the vehicle because she was afraid of getting injured in the pursuit, but Wilson refused to stop to let her out of the vehicle. Subsequent to this pursuit, the Tulare County Sheriff's Office served a search warrant at Wilson's house in Alpaugh and more stolen tools were located at his residence. The total value of recovered stolen tools is estimated at approximately $25,000. Wilson was booked into the Kings County Jail for 2800.2(a)VC-Felony evading, 207 PC-Kidnapping, 245(a)(1)PC- Assault with a deadly weapon, 496(a)PC-Possession of stolen property, 11377(a)H&S-Possession of a controlled substance and 11364(a)H&S-Possession of device used to ingest drugs. Wilsons bail is set at $225,000. Gutierrez was booked into the Kings County Jail for her active warrants. Tulare County Agriculture Detectives and Kings County Agriculture Detectives assisted in the apprehension of both suspects.